From Milan and Bologna: from motorways A1 and A14 take exit Cesena Nord and continue driving on the E45 road for Rome. Take exit Sansepolcro Nord, continue for 500m towards Sansepolcro, then turn right for Gragnano and follow the road signs for Calcinaia sul Lago. From Naples and Rome: from motorway A1 take exit Roma Orte and drive on the E45 road for Cesena/Ravenna. 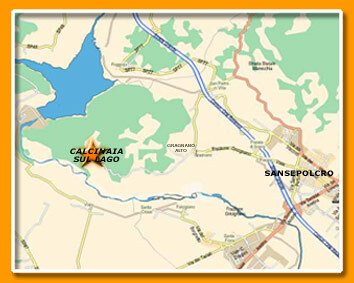 Take exit Sansepolcro Nord, continue for 500m towards Sansepolcro, then turn right for Gragnano andfollow the road signs for Calcinaia sul Lago.From Florence: from motorway A1 take exit Arezzo and continue on the state highway SS73 to Sansepolcro. From the train station of Arezzo, take a Sita coach bus to Sansepolcro. From the train station of Perugia take the train of the Ferrovia Centrale Umbra for Sansepolcro. Florence airport (Aeroporto Peretola) is about 110 km from our country house. Perugia airport (Aeroporto S. Egidio) is about 60 km from our country house.